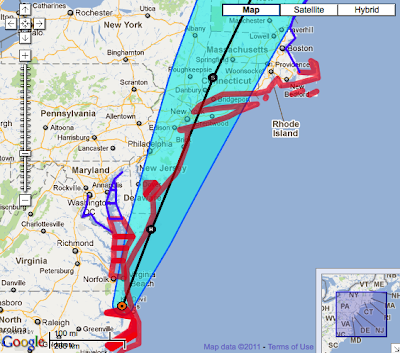 This weekend has a bit of an impending doom aspect to it, due to the approach of Hurricane Irene. I've never experienced a significant tropical cyclone, and while it will be quite cool in many ways, I suspect, I would prefer to pass. Anyway, here's the status as of early evening here in Cambridge, Mass. Radar image from Wunderground as of a few minutes ago. Note that radar does not extend too far out to sea, so a significant portion of the storm is omitted. First off, while the radar image above looks quite dramatic, the likelihood of a disastrous event here is very low. Storm surge will be low (and our house is at sufficient elevation to be safe from all but extreme storm surges), and wind will be exciting but significant destruction is unlikely (more on that below). We're on a bit of a hill, so flooding from rain should not be a problem. I suspect loss of power to be more likely than not, and that will be annoying. 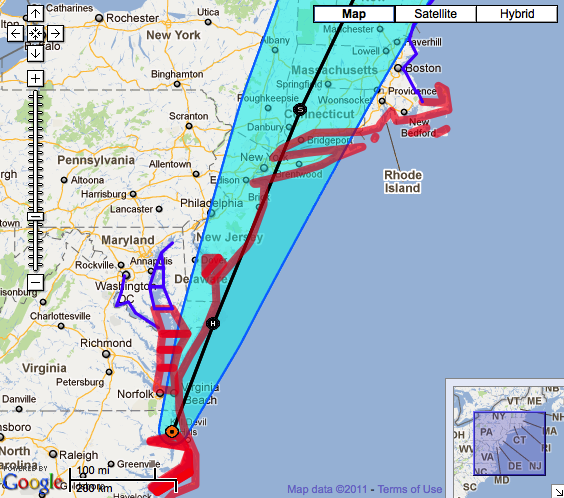 Storm track prediction from the National Hurricane Center's series of advisories for Irene. 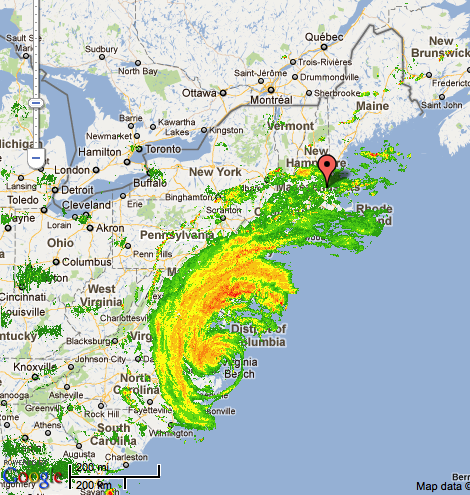 Irene is approaching from the south. The currently expected track, as seen above, is for the center of the storm to pass through the center of the state, and for it to be a tropical storm with sustained winds of 70 MPH, gusting to 85; of course, wind here in Cambridge is expected to be less. I am not a fan of wind. * I find it unnerving and ominous, much more so than rain or lightning. And this house rattles and creaks rather unpleasantly in high winds. My biggest fear is that the wind will knock over the house. Of course, the actual odds of this happening are essentially zero. I read up on wind damage thresholds, and stick-built houses are good for a lot more than a tropical storm several miles inland. Plus, this house is 100 years old and has been through a lot. Finally, I haven't seen anyone boarding up windows anywhere. Even losing the roof is quite unlikely, I believe. Couple of observations on this prediction. First, the inflection point on the wind, where it kicks up from calmish (15mph) to pretty windy (30mph) is between 4 and 5 am. Ugh! I strongly suspect it will wake me up. 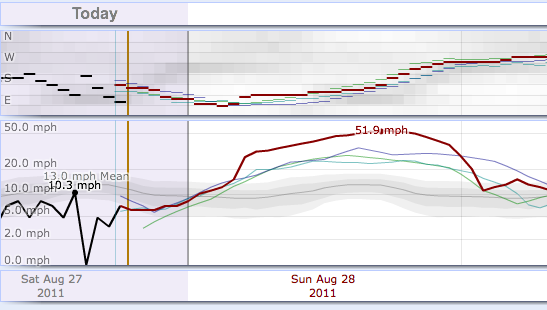 Peak sustained wind (52mph, with gusts beyond that of course) is at 5pm. It then drops off more rapidly than it built up, but still doesn't calm down until after midnight. We'll see how I feel, but I suspect I won't be able to sleep until it's clearly winding down, so it's looking like a long day, unfortunately. The NHC also publishes maps which I won't bore you with but which estimate the probability of hurricane-force winds (74mph sustained) at zero percent, 50-knot winds (58mph) at 20%, and tropical-storm force (39mph) at 70%. I think it would be cool if I could look up a probability distribution for my location (and I suspect the NHC's data would support this). I have plenty of food, cat food, and water (10 gallons potable plus a bathtubful that is a tad grimy). Flashlights are a dime a dozen in this household given our adventure habit, and I've got plenty of charged batteries. My cell phone has Internet connectivity. Potted plants and junk on the deck is inside. I'll wear shoes throughout the day in case I suddenly need to clean up glass. I think it will basically be a rainy day at home with extra drama, and hopefully not too much extra drama. See my Twitter stream for updates and hopefully some interesting photos.